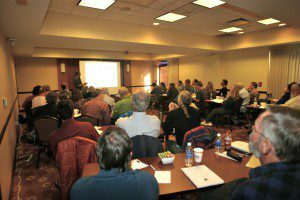 Last weekend in Denver, Colorado I held my first ever 2-day Straw Bale Design Seminar. The evening before the workshop began, I joined my friend Jim at the hotel bar for a beer. 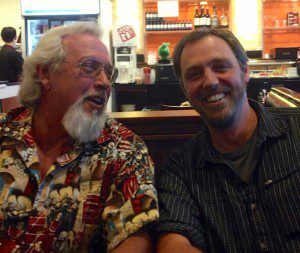 I met Jim last year at the Brownsville, Oregon straw bale workshop. While he and I caught up with each other another workshop graduate named Julie from the class in Crestone, Colorado, walked up and gave me a hug. She was too tired to hang out, but seeing her smiling face was enough to bring a smile to my own. Shortly after that, Susan (from the Missouri and North Dakota workshops) walked up and joined me and Jim at the bar. I realized in that moment just how much I truly love what I do. My job is one that allows me to meet amazing people from all over the world and to continually grow my circle of friends. On Saturday night, after the day’s session, a group of us went out to dinner and enjoyed the evening together. Thai and Japanese food, beer and wine, great conversations, and smiling faces made the evening. After dinner we retired to our rooms and settled in for the night. After an hour or so, I made my way back to the hotel lobby to “cook” a bag of microwave popcorn. When I got there, I noticed several folks from the class lounging on the couches. I took my snack over and joined them. We hung out, shared a bag of popcorn, swapped stories, and laughed late into the evening. Yes, I was in my pajamas and no, it totally didn’t matter. We were simply old and new friends hanging out and having a good time. There was no campfire nor guitars, but we found a way to have a blast nonetheless. The next morning, I found myself in the elevator with a friendly woman who asked me what I was teaching at the hotel. When I told her it was straw bale construction, she became very interested. Turns out she is an architect and the concept is something that has interested her for many years. I shared with her that since my past workshops have all been hands-on, the idea of teaching the design details of a straw bale home over two days in a hotel conference room was something that had taken me many years to wrap my head around. I have to admit that I was a bit nervous about the format of teaching in a hotel conference room; however, I can now say with complete confidence that this model for learning works. I suppose it would be silly for me to try and share the group experience via a blog post. We simply covered too much ground and had too much fun to sum it up in a few paragraphs. I’ll do my best, nonetheless, to let you in on it as best I can. Here’s what I can share. 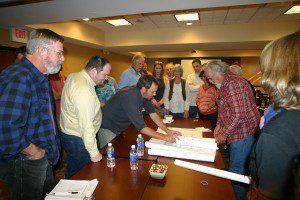 The simple format of the straw bale design seminar allowed us to discuss the inner workings of straw bale construction in great detail. We covered the construction details of building a straw bale home and how to properly represent those details on the construction drawings. We talked at great length about working with building departments, banks, insurance companies, and more. We dove into managing subcontractors, budgets, and time lines. We reviewed the plans that participants brought with them and offered feedback and guidance on each set. What I can’t share with you, or at least what I can’t do any justice in sharing on a blog entry, is the overall feeling of the weekend. For me, walking into a room full of people and immediately seeing faces I knew from previous workshops was so great. I started my workshop by hugging old friends and saying hello to new ones. I think there is something about starting a workshop that way because the smiles seemed to be contagious. I think they came from knowing that the room was full of like minded people willing to share their questions and experiences to help the group move forward. After all, people were there to learn more about the details of building their dream home. Sharing that experience with others who hold a similar dream is a great thing. If you have some ideas about specific locations or just want to be part of the conversation moving forward, please join us below in the comments section. Might want to consider Taos, NM. The area has been a focal for alternative building methods. Most famously the earthships, but I’ve also seen homes built from cob, plastic milk crates, sand bags, etc. There are also some straw bale homes. Andrew–It’s been awhile since we met at your clay workshop in Southern Oregon…. I’m in Spain right now, but soon to return to the US. There’s a green building institute in Portland, OR, called: Earth Advantage Institute, http://www.earthadvantage.org/, that I think would be a great place to teach a design workshop…. As for me, I’ve got my basic web domain up, as you can see, and will be making my land in NM, near Grants, a non-profit this year to promote strawbale building…. Any chance of my hosting a workshop there to build the center, octogon (post & beam) great-room next September? I’d also like to get np funding to promote this design and style of building with the Navajo nation, since hogans are usually 8-sided….This would mean two following workshops to build the first two SW-facing rooms and later, an identical two NE facing rooms off the great room….Let me know if there’s any chance you think that might be doable next year! Hi Tricia. Nice to hear from you. I have pretty much booked my 2013 workshop schedule already, so don’t think I can swing one on your property next year. Sorry. Thanks for the tip on the Earth Advantage Institute. I will check them out. Glad to hear that things are moving forward for you on your property. I wish you the best of success!!! Hi Paul. Funny you should say that as I am planning a workshop in Taos this July! I hope to see you there. When are you coming to Canada-particularily the westcoast? Maybe a weekend seminar in the sunny Okanagan (BC? Peachland/Summerland/Penticton/Kelowna? Sounds like we need to approach you years in advance for hosting workshops. How about Cherryville, BC, Canada in 2015/2016? I’m planning to grow my own straw & need a few years to get it right. Sure enjoy your posts. Down to earth & from the heart. Hi Melanie. Thanks for the kind words. I am pretty much booked up for 2013 and am starting to look at my 2014 schedule. I do have room in that line up as of today. I love BC and have happily worked there in the past. In fact, I just heard from a past participant from my Castlegar workshop yesterday. Anyway, I would be happy to return to BC to teach if the timing and project are right. Much of that depends on our other workshop locations as we try to spread out as much as possible. I’m in Indiana (Indianapolis area) and would love to see a design workshop here or within a day’s drive! Andrew since there is a whale of a lot of wheat straw generated in Umatilla County and in Eastern Oregon I think it would make sense to have a workshop or seminar here to show people what the other use of the product is besides livestock bedding. Blue Mountain Community College has a good Civil Engineering and Drafting program and with one of the instructors being an architect I think you might have a real good turn out. Spring 2013 might be prime time to do a Saturday/Sunday seminar. I have enjoyed following your informative website offerings and am savoring the idea of doing a 30x 42 shop in Nampa, Id. I have built all my life and am currently a registered contractor in Id. I wonder if our talents could meld into a mutually beneficial arrangement. Most of my building career has taken place in Bozeman, Mt. and recently moved to Id to be with family. I have been considering a workshop sometime in the future. I have 40 years building experience and like the challenge of an innovative energy efficient approach.Keep up the good work. Hi Christina. Thanks for the input! We are planning one in New York next and will certainly consider something in your neck of the woods after that. I figure places like San Francisco and Chicago would be good locations. I want to try and make it convenient to as many individuals as I can. Thanks Barbara. I’m not sure how it would work at a college rather than a private business like a hotel, but I am certainly open to it. Thanks for the suggestion. Thanks Don. As it happens, I’ll be teaching a 7-day workshop this summer in Montana. I would recommend you check it out as a participant before you decide to host, just so you can get clear about what’s involved. I’m happy to hear of your excitement of working with straw. It’s always great to hear from long time professionals who see the value in straw bale construction and want to learn a new and efficient building technique. Hopefully I’ll see you this summer!